The Curvy Lip Mug is the last mug design by mid-century designer and founder of Andersen Design, Weston Neil Andersen.. Weston was working on this design when he suffered a brain injury. Years later Mackenzie Andersen picked it up and realized that the idea was based on Weston' s classic sugar bowl design. We are now bringing this new mug into the market. The whimsical curved lip on the mug is scaled down and repeated in the curvy handle as an act of pure joy. 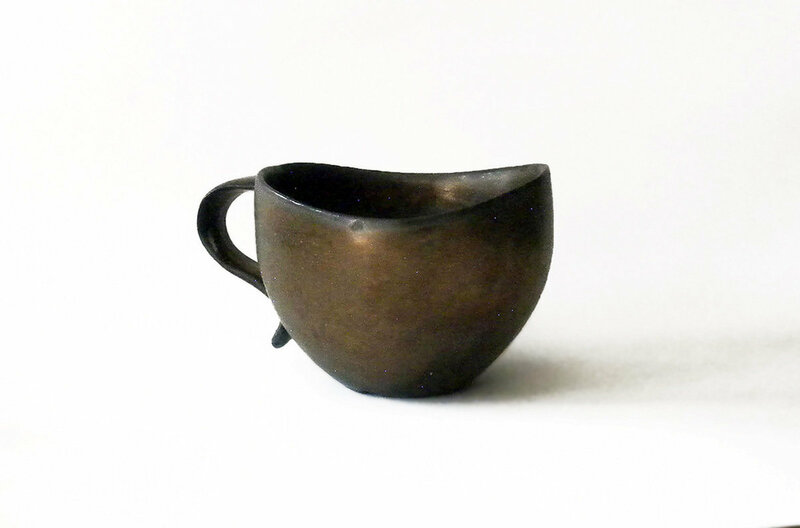 Our Bronze glaze is deliciously organic. Drinking out of a handcrafted mug is an addictive and sensual delight. You deserve it. This item is an individual item produced by our design process. We are trying to develop a way to work with other ceramic studios for mutual benefit so that Andersen Design can eventually be continued by future young Americans. We have a line of over 200 classic designs which engage unending creativity and have retained marketability over the decades. We feel mugs are the most flexible introductory item to work with on this project. 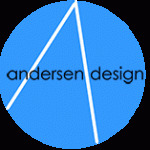 All Andersen Design mugs are slip cast and hand finished in America. The lip crafted to your drinking pleasure in a soft thin curve . The glaze has variations like a surface produced by nature. This mug is a studio work produced as part of a process of developing our glazes. in which we do a lot of experimentation before arriving at a production glaze. This mug has a variegated glossy sheen. It is four inches tall with an oval shaped opening which is 5 inches at it widest dimension. Enjoy. Imagine this mug done in infinite variety by many ceramic studios working in conjunction with Andersen Design,Made in America, each one expressing the individuality of the studio artisans ! If you support the continuation of Andersen Design as an American -made handcrafted product produced and expanded upon by future generations, please sign up for our KIckStarter prelaunch list HERE- Make sure Yes to sign up for KIckStarter Prelaunch is checked at the bottom of the form !